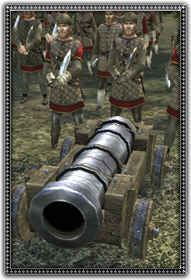 The first primitive gunpowder siege artillery, bombards were created in China and Western Europe in the early 14th century and spread to the rest of the world by the late 14th century. They are forged from bronze or iron, and designed to fire stone balls that crumble enemy defences. They also shoot inaccurate flaming balls wrapped in pitch-soaked rags, that can incinerate enemy troops!